For example, an optochemically controlled T7 RNA polymerase was constructed by blocking access to the active site for incoming nucleotide triphosphates through installation of a caging group on a crucial lysine residue. The genetically encoded light-controlled enzyme was completely inactive when expressed in mammalian cells, until a brief UV illumination removed the caging group, thereby allowing access to the active site and activating RNA polymerization. 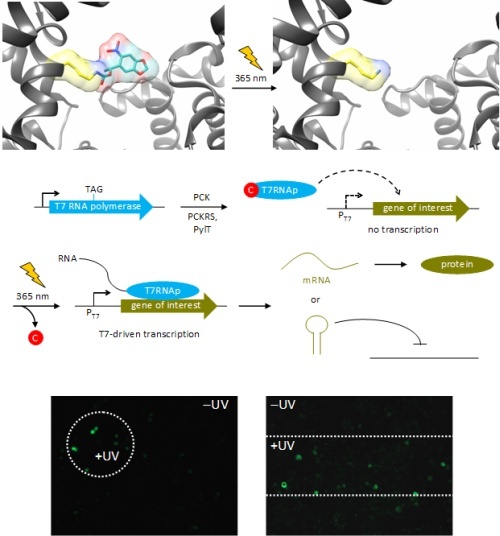 By engineering cells that express the caged polymerase with genes or non-coding RNA sequences under control of a T7 promoter, we were able to achieve optochemical gene activation and light-triggered RNA interference. This enabled spatial control of gene function in mammalian cells, as shown for the localized activation of GFP in mammalian tissue culture. Importantly, only cells that were exposed to UV light display activation of protein expression.